What would it look like if the Dominion stayed in the Gamma Quadrant? Imagine them in a form that didn't focus on war or battle, or even establishing a foothold, but just solving missions … locally. Another is the Dosi Trading Post, a station with SHIELDS of 20. 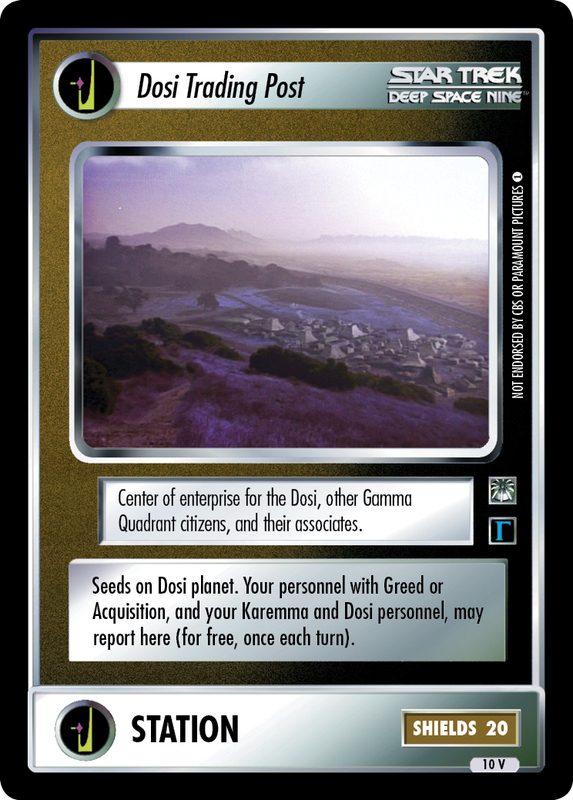 It seeds on the "Dosi Planet", which is familiar as the location of the mission Tulaberry Wine Negotiations from the Rules of Acquisition expansion. There's also a new version of that mission persona in the current set, Further Tulaberry Talks. And like many modern facilities, it allows certain personnel to report for free. It doesn't give you any of the most frequently seen species: Changeling, Vorta, and Jem'Hadar. Instead, it focuses on the merchants and hagglers: the Dosi with whom Quark initially negotiated over Tulaberry Wine (3 personnel, all universal); the Karemma with whom he traded later on (2 personnel, one unique); and any other personnel with Greed or Acquisition (3 personnel, one of whom you'll see next week). Note that they still have to be personnel, since any reporting abilities of facility and site cards come with quadrant restrictions. Vash can report there because of her own text, but she won't report for free. Interestingly, because it is a station and not an outpost, it does not allow any other cards to even report. For example, no ships. Those cards bring this deck up to three free report engines: Dosi/Karemma for free at the Trading Post, Changelings for free at The Great Link, and Vorta for free (generally, wherever they report; in this deck, that's only at The Great Link). 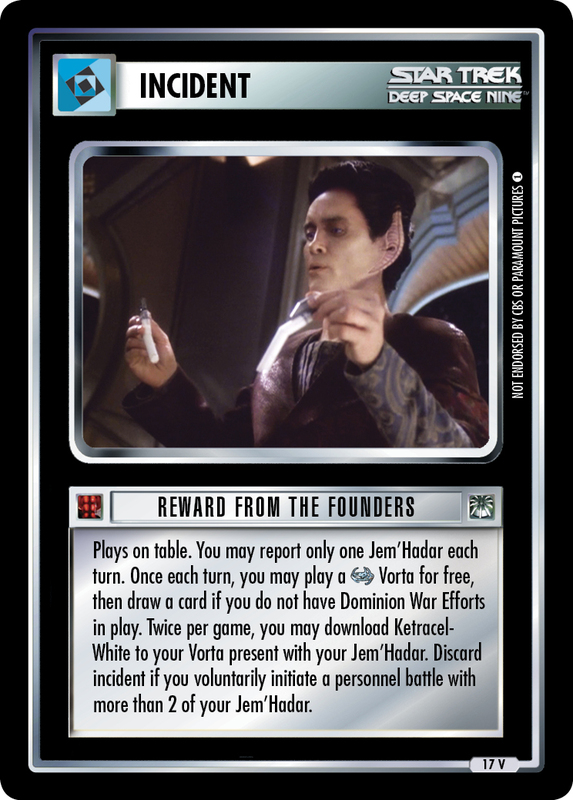 Add to this a download of a Jem'Hadar every turn from ASP/DWE (granting a Deyos draw), and we might get quite a few personnel in play each turn, aside from the card play. To feed those plays, the main draw engine is Handshake, to redraw a new hand of seven when when you've played a few for free but could use a different hand. And since that will end up discarding several cards which you might need later, Isomagnetic Disintegrator is here to get them back. On the turns when you don't use your card play for Handshake, you might use it for a ship. The ones in this deck are all generally fast to begin with, and you get a range reduction from The First Stable Wormhole (and the Things Past Battleship is very fast, now that we're actually using Vorta.) If you don't draw a ship quickly enough, you can get one with Call for Reinforcements. With no outpost, it's also the only way for you to repair your ships. The deck's plan is generally to stay in the Gamma Quadrant and solve missions with all those free personnel. Hopefully, you'll have the 5-mission spaceline all to yourself. (And Hanok's 35th Rule will give you draws if that's true.) To help ensure that, don't even download the Bajoran Wormhole when you seed The First Stable Wormhole. Just solve your missions in possible isolation, and you might use your fast ships and your span reduction for some quick Cytherians points. If your opponent does force you to come to Alpha with You Are A Monument, then Talak'talan can download Ultimatum to get the wormhole.